A lawn made from turf costs more than one from seed, but produces a near instant effect which can be used sooner. Soil preparation is all-important to ensure the turf thrives once it is laid. Credit: RHS/Tim Sandall. Laying a lawn from turf is a quick way to get an instant result. It is good for situations where you can't keep off a lawn for the two or three weeks you need with seed. So for people with children or pets, it is often a good option, as you can be back on the lawn within a couple of days of laying. Although laying turf is a quick way to achieve lawn cover, soil preparation before laying turves is just as important as for sowing seed. Turf is best laid in mid-autumn, but can be laid any time between mid-autumn and late winter whenever the soil is not too wet or frosty. In spring and autumn little mowing is needed so newly-laid turf can be left relatively undisturbed for several weeks. Turf laid in spring often needs watering in dry spells over summer. Both dry soils and mowing before grass is fully rooted, stresses turf and delays rooting. Turf-laying is best avoided from mid-spring until early autumn to avoid the need to repeated watering. Good seed bed preparation is the key to establishing a successful lawn. Pay particular attention to clearing weeds and cultivating the surface to a fine tilth. Complete all site preparation before buying, or taking delivery of turves. Bought turves may vary in both size and thickness. Check dimensions when planning the lawn. Eliminate perennial weeds such as couch grass or bindweed well before beginning to prepare the soil. Use weedkiller, or hand weed. Do not use residual weedkiller, as it can remain in the soil and will prevent the grass from establishing. Dig in some well-rotted manure or other organic matter (especially on a sandy soil) to hold moisture. Make sure it is well-rotted, as un-rotted organic matter will cause the soil surface to sink unevenly as it decays. After cultivation leave for several days to settle - the longer the better, ideally five to six weeks or more. Before the next stage of preparation, remove any weeds that have germinated. Hand-removal is best, or use a contact weedkiller. Do not use a residual weedkiller, as it will prevent the grass from establishing. To get the level surface that is crucial for the best lawns, tread the area several times in different directions and then rake several times also in different directions. If laying is delayed, then the turves should be laid out flat to avoid any discolouring and weakening, but where possible laying should be done within 24 hours of delivery. Gardeners sometimes need to lift turf themselves using a spade or ‘turfing iron’ and then trim each turf to a regular size and depth. To do this, place the turf upside down in a prepared wooden box and slice off soil at the correct depth. The thinner the turf is (within reason) the better the rooting; a 2cm (¾in) turf roots better than a 7.5cm (3in) turf. Avoid turf that contains a lot of weed. Begin at one side or one corner and work across so that the person laying the turf faces the bare soil. Avoid foot indentations in the newly laid turf by working from boards. Lay sods with staggered joints as in the pattern of a brick wall and closely butted together avoiding gaps. Ensure the turves are level by having a bucket of sandy soil at hand and adding or removing soil as necessary. Once all the turf has been laid it can be firmed lightly with a light roller or a home-made ‘tamper’ consisting of a piece of flat wood attached at right angles to a broom handle. 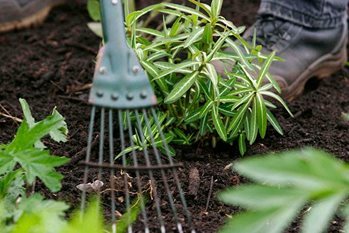 When laying is complete, lightly spread a mixture of sand and soil or compost and work into the joints, using a rake or brush. This top-dressing fills any minor hollows and also helps the turves knit together and become established more quickly. After top-dressing, leave the turf undisturbed; the first few days are critical for root development. Where disturbed soil, such as old flower beds, are being turfed, the new turf should be laid slightly higher than the rest to prevent a hollow developing as the soil settles. In dry weather, frequent watering may be necessary to keep the new turf constantly moist. During dry periods in mid- to late summer, water every five to 10 days. At other seasons water during dry periods every 14 days. Be careful not to over-water, as this can lead to shallow rooting and encourages the weed grass, annual meadow grass. Mow, with the blades set high, as soon as the grass has grown to about 5cm (2in). Laying turf to make a lawn is problem free as long as turf is kept watered until it has rooted into the underlying soil.